the possibilities are limitless. The MC9900 has a large touch screen which tells you everything you need to know. Choose from one of the built-in designs or download from the internet. Resize, edit or combine designs to make your project unique. The MC9900 stops automatically after sewing each colour in the design. Simply thread up the next colour and see the design develop before your eyes. And for normal sewing it is packed full of stitches and powerful features to enhance any project. 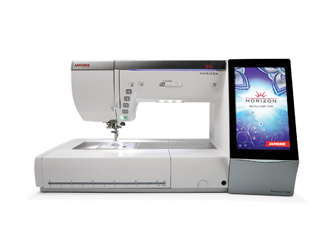 With a 440mm ( 17.3 ) bed and 280mm ( 11) right of the needle, this machine has more space than any other Janome. The new built-in embroidery system is the most stable weve ever developed ensuring embroidery perfection! It is packed full of powerful yet easy to use features such as, AcuFeed Flex, Horizon-Link, Stitch Composer and Janomes exclusive AcuFil Quilting System. It can stitch at up to 1,000 s.p.m. in 9mm wide stitches and with the option of 91 needle positions .. incredible speed and precision in one machine. And so much more than you could imagine!